Few months back, I did a quick review of the freshly GA’d PowerShell Core in the context of running your day-to-day Office 365 related tasks. As expected, it didn’t perform that well. Due to the various dependencies on the underlying .NET binaries, every Office 365 workload that required a module was a no-go when run in Core. Only the good old Remote PowerShell for Exchange Online worked, and only when using Basic authentication. Yes, it’s a Preview version, as the name implies. But it most definitely isn’t a Private Preview version, or only available via the PSGallery Internal repository, as everyone using Azure Cloud Shell has access to it. And since you have the module installed in ACS, you can just grab it and start using it on any other endpoints utilizing PowerShell Core. 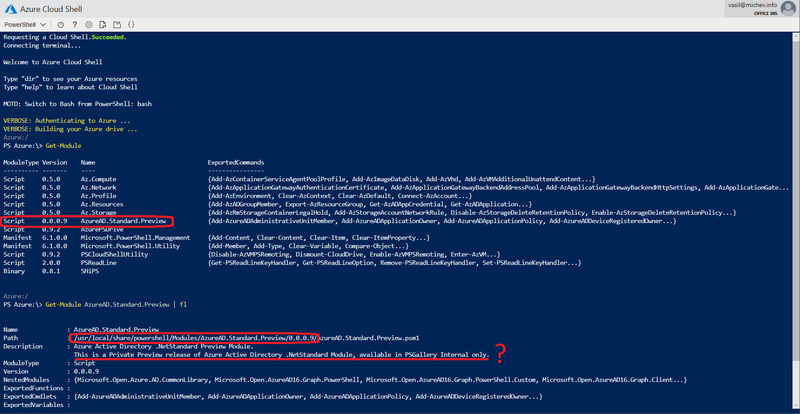 If you examine the module code, or simply browse the directory, you will notice that two versions of the binaries are provided, one for the “full” version of PowerShell, so .Net 4.7.1, and another one using .Net Core. We are more interested in the latter, which is automatically selected when you load the module in PowerShell Core host.